God made us with a unique set of five senses: smelling, tasting, feeling, hearing, and seeing. They are what make us compatible to live in this natural world He made. Without them, we would self-destruct because we couldn’t make solid decisions. We’d burn ourselves if we couldn’t sense something was hot. We’d run into things if we couldn’t see where we were going. We’d get ran over if we couldn’t hear the cars coming. We couldn’t communicate to save our lives without the use of our mouths. God definitely knew what He was doing when He graced us with these abilities! But even with these needed senses, we can still stumble if we choose to live by them alone. Neglecting the supernatural, our survival and success in life is limited, and perhaps even fatal. How many of us operate in the supernatural on a daily basis? How many of us expect to see a supernatural miracle in a world dominated by the five senses? As Christians, we have already experienced the supernatural. The first supernatural event that happened was when God spoke, and the world came into existence (Genesis 1, 2). We’re here because of the supernatural power of God! The second supernatural even occurred in our lives was when we received Jesus as Lord and Savior. God took out the sinful spirit on the inside of us and replaced it with His spirit, sin-free and as perfect as He is. No natural event could have made either of these things happen! We serve a supernatural God that is unlimited by the natural world we live in. He is a spirit being, supernatural alone in the sense that we can’t see Him. But He is also supernatural in the way He operates. Consider some of the greatest Bible stories we may have grown up hearing. If you’re like me, you may have heard them so many times that you take them for granted. But they are far from insignificant. In a world that celebrates Superman and the Twilight series, these true-life stories from the Bible have been ignored and neglected. The Flood that destroyed the world. Sarah’s pregnancy at an old age. The Fall of Jericho’s walls. The sun standing still for Israel’s victory. The shutting of lion’s mouths to protect Daniel. Mary’s pregnancy though she was a virgin. Hundreds of healing, deliverance, and provision miracles performed by Jesus and the Apostles. The common denominator to all these stories is that they were done for and through people who served and trusted in a supernatural God. They didn’t naturally occur simply because someone wished them to, or exercised their own power in God’s absence. They had supernatural power working on their behalf. It is clear that God doesn’t operate by man’s limitations. His mind doesn’t even consider the natural when He moves to do something. 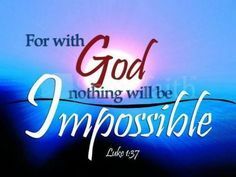 When man says something is impossible, God declares that all things are possible. We greatly hinder God’s ability to operate supernaturally in our lives when we forget His supernatural power. When we see catastrophe happening all around us and shake in fear, we stop His supernatural ability to protect us. When we get a bad doctor’s diagnosis that’s rendered incurable, we limit His power to heal us. When we look at our stack of bills and determine that we’re going under, we stop His provision from reaching us. Experiencing God’s supernatural hand at work in our lives is wholly dependent on our faith. On the other hand, those who choose to ignore the natural and consider only the supernatural, open the door for supernatural intervention from God Himself. Their faith in God alone pleases God to the point that He will make all things possible! The biggest problem in our lives doesn’t stand a chance when confronted by the supernatural power of God. It’s not a matter of how He will do it that matters; it’s knowing and trusting that He will!